LaFever Excavating, Inc. has an absolute commitment to providing the highest quality excavating services at a superior value to every client we serve. Our entire staff takes pride in this straightforward, honest objective. It is based on the simple principle to deal with others as we wish them to deal with us. LaFever Excavating, Inc. is a leading excavating contractor located in southeastern New York State. Over the course of more than 60 years, we have provided commercial, residential, and municipal sectors on a wide range of projects throughout Delaware, and parts of Otsego, Schoharie, and Ulster counties. We invite you to click on our Residential Projects Gallery and our Commercial Projects Gallery to view samplings of our work. LaFever Excavating. Inc. is located one mile east of Bovina Center, New York on Delaware County Route 6. On the map below, our offices can be found at the black dot. 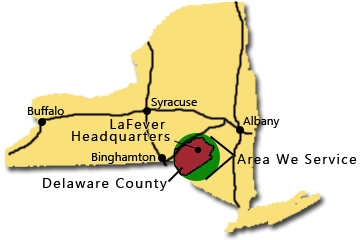 The green circle shows the area that we service, and the red area is Delaware County. Need a Hand Getting in the Dirt? We can help you get your job done, large or small, from land clearing, to digging your dream pond, to driveway installation or even a simple grade, installing a septic system, or any other needs. Remember, “The Earth is our Business.” Click on the yellow machines to get in contact with Jonathan LaFever for a quote.